Fall trends include studs again. We saw them everywhere this year and for Fall 2010 we see them back and stronger than ever. Studded boots and shoes are a must have from day to night. Check out some of PrivyDoll's favorite picks for fall. This shoe seen on the left is from one of our favorite trend sites, Akira Online Boutique for $189. These shoes have been seen on many runways for 5 times the price. Enjoy the studded finds below! Love these 'ice gray' booties found on PiperLime for $180. How cute are these studded, lace up oxfords?! Found on one of my favorite sites, www.asos.com which offers free shipping to the US and returns!! These are on sale for 28EUR. Pre order these fabulous sneaker pumps from designer UES now selling the line on Saks.com after a partnership with Steve Madden. 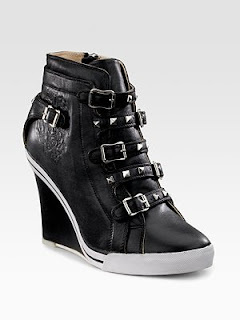 The unique line incorporates studs with buckles for $195.